Last Wednesday was Epiphany. In Spain it is also a public holiday - Los Reyes Magos - a festival which celebrates the visit of the three wise men who came from the East to find the infant Jesus. Coincidentally on the eve of Epiphany this year the Moncloa did receive a visit from three wise men, although it is not clear whether they came (as tradition would have it) bearing gifts, or whether they brought with them a list of demands from further East in Europe about what Spain's government ought to be doing to stop its economy falling apart. Unfortunately, due to a technical fault (some say the website was hacked) there to meet them as they entered the gateway and fired up the browsers on their xmas-new I-Phones was not the Spanish Prime Minister, but a strange interloper, otherwise known as Mr Bean. By any standards, it was an unfortunate beginning. Spain’s six-month presidency of the European Union, which got underway this week, appears to have been subject to an attack by computer-hackers. On its first day, web-surfers navigating to the special presidency website found themselves staring at photos of Mr Bean, the hapless British comedy character who (some claim), bears a resemblance to José Luis Rodríguez Zapatero, the Spanish prime minister. But the FT also makes a rather more serious point: "Mr Bean is famous for his stumbles and mishaps – and Spain is also looking accident-prone at the moment." This certainly rings true to me. And as if to confirm the point, Spain's Secretary of State for European Affairs Diego Lopez Garrido stepped forward from behind the curtain yesterday - apparently representing the EU - to warn the Greek government that while coordinatinion within the EU was necessary "there is a limit, which is no bailout." A point which various European officials had spent the best part of the week trying to deny (or at least strongly qualify) following Juergen Stark's unfortunate Italian interview. Evidently news reaches Madrid slowly. The only fortunate thing in all this, is that most people don't know who the hell Diego Lopez Garrido is, and probably it's better that way, although the prospect of a six month Spanish presidency may make this situation hard to sustain. And then we have the strange visit of the three wise men. According to reports in the Spanish press José Luis Rodriguez Zapatero, chaired, last Tuesday, a meeting in the Moncloa with a number of former politicians who are apparently - according to the press release - considered to be "Europe's wise men": Jacques Delors (former European Commission president), Felipe Gonzalez (former Spanish prime minister), and Pedro Solbes (former Spanish economy minister). Elena Salgado, current Spanish economy minister also attended the meeting. They ostensibly met to discuss ways out of the crisis and plans for “European economic government”. The discussions, which lasted around three hours, were described as being “very useful” and primarily concerned with “strengthening policies for economic coordination” in Europe. Meanwhile, European Council President Herman Van Rompuy has convened an extraordinary EU summit, on 11 February, to discuss economic recovery, where the proposals which Zapatero was discussing with the three wise men will need to be presented. What could all this mean, I asked myself? For an initiative on this scale, the composition of the meeting was hardly representative. And two of those present - Felipe Gonzalez and Pedro Solbes - while being highly regarded in Brussels, have both been publicly and strongly critical of the economic policy of the present Spanish government, so the conversation would have been far from cordial, to say the least. And what was Delors doing there? It couldn't be, could it, that they were conveying a rather strong message that Spain has to get its act together if it doesn't want to end up where Greece is now. Fortunately some additional light was thrown on the situation by an FT article this morning - the European Union is indeed planning to strengthen policies for economic cordination, but it is planning to do this by giving more power to the EU Council and Commission to apply “corrective measures” against those member states that fail to meet their obligations under a new 10-year plan (yet to be outlined) designed to improve EU competitiveness and bring all that public debt back under control. And the irony of ironies in all this and is that the set of proposals are going to be advanced by non other than José Luis Rodriguez Zapatero. That is, the turkey is actually about to propose the menu for xmas lunch. As the FT puts it: "In a proposal likely to stir controversy among other EU governments, Mr Zapatero said the European Commission should be granted powers to police compliance with the plan, which is expected to be adopted in March and is known as the '2020 strategy'". Obviously Spain is likely to be the next country after Greece to be on the receiving end of just these very corrective measures? No wonder he was looking so grim before the TV cameras after last Tuesday's meeting. What do you bet we don't hear anything more of this "wise men" initiative, at least until not the next Epiphany. Retail sales also continue to fall regardless. They were down 1.2% from October (seasonally adjusted) in November. And they are now down nearly 12% from their November 2007 peak. The pace of decline is slow, but the attrition is constant, and there is no end in sight. Of course, I didn't get everything right in 2009. I was right that unemployment would go up and up, but it didn't go up as fast as I had been expecting, and the INEM labour exchange signings came in still just shy of the 4 million mark in December, while I was forecasting back in April that we would hit 4.5 million by the end of the year. What I hadn't anticipated adequately I think was extent to which the stimulus programme would generate labour intensive employment, and the degree to which people could be moved over from unemployment into training courses, etc. Then again, most of the earlier waves of unemployment came from people on temporary contracts that were terminated, and now the people to go will be in permanent forms of employment, and evidently dismissing people with such contracts (unless the company simply goes bankrupt) is a much more laborious and costly process. Still, according to the Labour Force Survey methodology as supplied to Eurostat the 4.5 million milestone has now been passed, and onwards and upwards we go. Certainly the numbers may not have gone up quite as much as I expected, but a rise of 794,640 in the number of unemployed over the last year however (while less than the 2008 increase) is hardly to be sneezed at. In fact unemployment was up 25.4 per cent in 2009. And more bad news on unemployment again today, since even if Spain provides only quarterly data on the unemployment rate, the European Union statistics agency Eurostat give a monthly, seasonally corrected number, which stood at 19.4 per cent in November, the second highest rate in the whole EU bloc behind Latvia. And youth unemployment is far worse, with Spain now facing the real prospect of having a "lost generation", since unemployment among people aged from 16 to 24 is now 43.8 percent, the highest in Europe, and more than double the overall rate. The increase in unemployment among young people has been especially traumatic, with the rate jumping from 17.5 percent three years ago to the current level. And here again Spain stands out even among other European countries with problematic economies. In Greece, for example, the youth unemployment rate is 25 percent, while Ireland’s is 28.4 percent and Italy’s is 26.9 percent. Month on month the number of people seeking jobless benefits rose by 54,657 in December from November, or by 1.4 per cent. 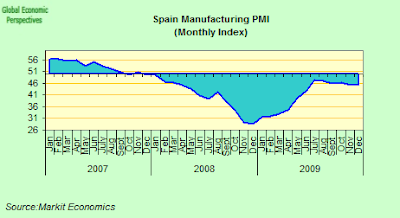 Spain has said it wants to make the fight against unemployment one of the key planks of it EU presidency, but the Spanish government are the only ones who still foresee a return to falling jobless rates in Spain before the end of 2010. Both the EU Commission and the IMF don't see any easing in current levels even in 2011. The simple reason for this is that even the most favourable forecasts for economic growth in the Spanish economy over this period will be weak, and then if you allow for productivity improvements, then the rise in output simply won't be sufficient to generate employment. And if you accept a more downside estimate like mine, then the unemployment level won't even stagnate, it will continue to rise. Maybe we won't see 25% in the first half of 2010, but we certainly could in the second half. Unemployment wasn't the only thing I didn't get quite right last year. 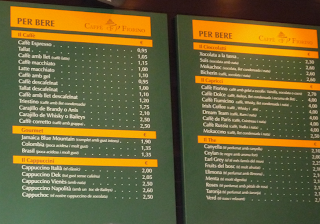 I don't know how many of you remember the price list from my local bar I posted last January (see below), well I have to report it is exactly the same this January. The price of a coffee and croissant hasn't gone up, but it also hasn't come down, as I was suggesting it might. 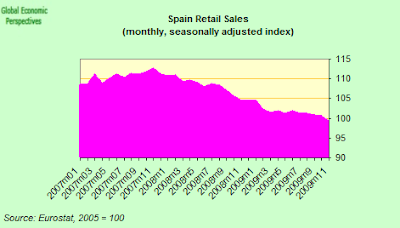 In fact Spanish 12-month inflation was 0.9 per cent on the year, suggesting that prices are rising (in general) rather than falling. So you could say, whatever happened to your "deflation scare"? Well basically, it has been put on ice. But it will come back. If we look at what the EU are proposing in Greece, it is not only a reduction in the current fiscal deficit, it is a restoration of competitiveness. This correction of the external balances and restoration of competitiveness will also be a core part of the 2020 plan. What this means effectively means is internal devaluation. And using the same logic it is clear that it is just this policy which the new "co-ercive" economic coordination introduce in Spain under the "2020 (vision) strategy" - using those very powers which José Luis Zapatero is himself now proposing. 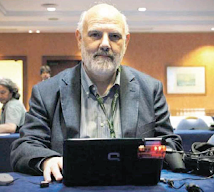 I have an interview with Paul Krugman in today's edition of La Vanguardia (in Spanish). Below I reproduce the English original. As will be evident, there are many topics about which Paul and I are far from being in complete agreement. But on one topic we are in complete harmony: the diffficult situation which now faces Spain, the need for internal devaluation, and the threat which continuing inaction on the part of Spain's current leaders represents for the future of the entire Eurozone. Edward Hugh: In your NYT article "How Did Economists Get It All So Wrong", you state what I imagine for many is the obvious, that few economists saw our current crisis coming. The Spanish economist Luis Garicano even made himself famous for a day because he was asked by the Queen of England the very question I would now like to put to you: could you briefly explain to a Spanish public why you think this was? Paul Krugman: I think that what happened was a combination of two things. First, the academic side of economics fell too much in love with beautiful mathematical models, which created a bias toward assuming perfect markets. (Perfect markets lead to nice math; imperfect markets are a lot messier). Second, the same forces that lead to financial bubbles – prolonged good news tends to silence the skeptics – also applied to economists. Those who rationalized the way things were going gained credibility until the day things fell apart. E.H. : The late Sir Karl Popper used to contrast what he regarded as science with ideologies like Marxism and Psychoanalysis, because there seemed to be no way whatever of consenually agreeing with their practitioners a series of simple tests which would enable their theories to be falsified. Some critics of neoclassical economics - including Popper's heir Imre Lakatos - have expressed similar frustrations. Do you think we economists are, as a profession, up to the challenge of formulating testable hypotheses in such a way that the public at large might come to have more confidence in what we are up to, or are we a lost cause? E.H.: Comparing the types and levels of indebtedness in the United States as between 1929 and 2007 one factor immediately stands out, the importance in modern times of the financial sector. You have repeatedly drawn attention to this phenomenon, and to how the unbridled growth of the institutions associated with it inevitably sowed the seeds of the problem which eventually came. Is there a road back? Can we reduce the strategic importance of this sector in developed economies and still generate meaningful economic growth? P.K. : We grew fine for 30 years after World War II with a much smaller financial sector. I think if we tax and regulate the sector, we can replace it with other, more productive uses of resources – everything from manufacturing to health care. E.H.: Another of the distinguishing characteristics of the global economy over the last decade has been the development of large and sustained imbalances, with the US-China one being only the most publicly visible. Here in Europe we also have strong and notable differences between export driven economies like the German and the Swedish ones and many of those in the South and East which have evolved models based on consumer and corporate indebtedness and import dependence. Do you think we have the policy tools available to address such issues, and if so, where do we start? P.K. : On the domestic side in advanced countries, financial reform should help reduce debt reliance. As for the developing country capital surpluses, that’s heading for a big confrontation. In the end, either China in particular increases domestic spending, or there will be some kind of at least threatened trade war. E.H.: One of the standard pieces of economic observation about countries recovering from financial crises is that their recoveries are export driven. This has now almost attained the status of a stylised fact. But as you starkly ask, at a time when the financial crisis is generalised across all developed economies - whether because those who borrowed the money now have difficulty paying back, or those who leant it now struggle to recover the money owed them - to which new planet are we all going to export? Maybe we don't need to look so far afield. Many developing economies badly need cheap and responsible credit lines, and access to state-of-the-art technologies. Do you think there is room for some sort of New Marshall Plan initiative, to generate a win-win dynamic for all of us? E.H.: Last December you publicly warned of a burgeoning economic crisis on Europe's outer frontiers. Indeed you even went so far as to state that the center of the present crisis had "moved from the U.S. housing market to the European periphery" - and by periphery here I take it you mean countries like Ireland, Spain, Greece, Romania, Bulgaria, Hungary and the Baltics. With hindsight, and looking at how Europe sovereign debt, with Greece in the forefront, has suddenly become the "plat du jour" for the financial markets, this seems to have been extraordinarily perceptive. What was it about the situation on Europe's periphery that attracted your attention at such an early stage? P.K. : Numbers, numbers, numbers. Those huge current account deficits practically screamed “bubble”. In general, it’s been amazing how useful even very rough measures of imbalance have been at predicting crisis, in everything from U.S. housing to Latvia. And that makes it even more amazing how few people recognized the warning signs. E.H.: One of the most significant recent monetary initiatives - the Euro - is now nearly ten years old. On its fifth birthday Ben Bernanke described it as a "great experiment", do you think this description still fits the case, or is it now possible to start to draw some tentative conclusions? P.K. : It’s still very much an experiment. We’re only seeing the real downside now, as the eurozone tries to cope with the unwinding of large internal imbalances. Until we see how that goes, the judgment on the euro will remain in doubt. E.H.: A number of Eurozone economies are currently in some difficulty due to their high general level of indebtedness and a loss of price competitiveness which makes exporting their way out of their problems quite hard. This issue becomes even larger given that these economies no longer have a currency to devalue, In a speech earlier this year in Argentina you said that Spain now had no alternative but to carry out a systematic reduction of prices and wages in order to restore competitiveness. 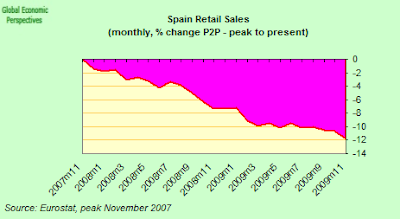 For a Spanish public which is far from convinced that this is the case, could you briefly explain why this is so? P.K. : Put it this way: for a number of years Spain could pay its way within the eurozone by selling assets, mainly real estate, as the inflow of capital financed a huge housing boom. That allowed Spanish wages to rise relative to those in other European countries. But now the housing boom has gone bust, and the big inflows of money are over. So Spain needs to compete in producing real stuff, such as manufactured goods. And it won’t be able to do that unless it has a major gain in productivity through wage reductions. E.H.: In the Latvian context the expression "internal devaluation" has been advanced to describe this kind of wage and price correction process. The expression has a very attractive feel about it, but as you recently pointed out in your NYT blog (The Pain In Spain) the changes involved are far from easy to implement, with consequences which are normally none too pleasant for those on the receiving end. Indeed they bear a striking resemblance to what used to be called wage and price deflation in the 1930s. Have we really advanced so little in all these years, or are there now more sophistocated policy instruments available to public authorities to implement such changes in a way that parallels the monetary policy improvements which we have seen in action during the present crisis? P.K. : I wish I had some clever suggestions. But the essentials of economics change much less than the façade. The truth is that Spain is very much in the same situation as gold-standard countries in the 1930s; in some ways worse, because it lacks the option of using trade policy as a substitute for devaluation. So deflation it must be. E.H.: Finally, as one decade draws to a close, and another opens, are there any grounds for optimism? You often speak of the return of depression economics, is what we once called the "modern growth era" now decidedly over, or are we simply passing through an interlude, with a new dawn out there waiting for us, somewhere just over the horizon? P.K. : We will recover eventually. And we have learned some things since the Depression, which was why this hasn’t been nearly as bad. Overall, leadership is better – I’m especially relieved that we have smart, well-intentioned people running my own country, which is a major improvement. So sure, things will improve. But it’s going to be a hard slog.